This map shows where the Kays, and all variants of the name, were living in England in 1891. Hover over a county to see the proportion of the total that were living there and a breakdown of the names; an explanation of this box is given below. If you are using a device with a touch-sensitive screen, you can also touch the county to show the information. We’ve made London bigger than it was at the time so you stand a chance of seeing it. The map as shown here makes one thing glaringly obvious, that most of the Kays were living in Lancashire and Yorkshire at the time. But that obscures where the others were living. At the bottom of the Key, there are two arrows that allow you to change the weight given to the numbers; repeated clicking on the right arrow will move you to a better idea of where they were living in the other counties, clicking on the left will move you back to this display. You will find you’ll need to click the right arrow a few times before you begin to see an effect. Underneath these, there is also a link that allows you to change the names being looked at and reflect your new selection on the map. This also is explained more fully further down the page. The information box that’s displayed when you hover over a county carries a lot of information. Its aim is to show how many people lived in the county, and what spellings were used. The first line shows the total number in the county (all spellings), and the percentage of the total across England and Wales that represents. The other lines show each of the spellings of the names we’re looking at, and how often they occur. 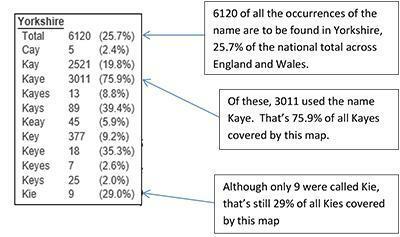 The percentage is based on the total for that name across England and Wales. You can change the names being shown on the map by clicking on the ‘Select names’ link at the bottom of the key. The box shown is simply a list of the names this map covers. Click on the tick boxes to include or exclude names to examine the ones you’re interested in. The changes will be reflected immediately on the map and you can still hover over a county to examine the breakdown. We hope this will give you the chance to do your own investigation into your family’s name. Be warned that if you’ve using the arrows to change the colours displayed, this could cause some anomalies if you then start changing the names being examined. Worst case, refresh the page and start again.